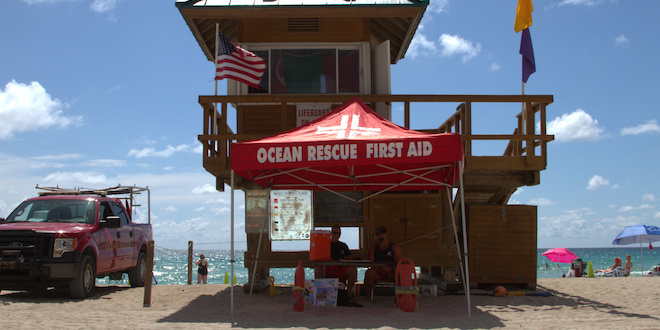 Friday, April 27, 2018 — May is National Water Safety Month and Sunny Isles Beach Ocean Rescue participates by offering special information sessions to residents and visitors at Tower 174 on the beach. These sessions will take place from 9:30 am to 12:30 pm on May 23-25 and May 28 & 29. Visit the men and women that staff our lifeguard towers 365 days a year and learn about measures they take to ensure your safety. If you are not able to get to a session, be sure to stop at a lifeguard tower the next time you go to the beach and take note of the flags that are flying that day and information provided on the board, which is updated daily with the UV index and temperatures. You can also find daily beach conditions on our website at sibfl.net/current-beach-conditions, which are also updated daily by our lifeguards. Remember to always swim near a lifeguard! Information from Ocean Rescue is also shared via our Police Department social media pages. Follow these pages on Facebook and Twitter: @SIBPD.